Packaging Materials Market size will surpass USD 1.3 trillion by 2024; according to a new research report by Global Market Insights, Inc. Developments in the Asia Pacific food & beverage sector will be a major reason behind the growth of packaging materials market growth. The Asia Pacific region includes a large number of emerging economies such as China, India, South Korea, etc. These countries have been witnessing increased consumption of food & beverage products which will in turn drive packaging materials market demand. In 2016, the Asia Pacific food & beverage industry registered a turnover of exceeding USD 3 trillion and is likely to witness a high growth rate. The three most important food segments that are driving the Asia Pacific food market are grain mill products, meat products, and oils and fats. These developments will boost demand for flexible & rigid plastics, glass, metal, and paper packaging materials demand throughout the forecast span. Consumption of beverages in Asia Pacific has also been on the rise in the last two decades. The region is the largest beverage market in the world accounting for more than 40% of the worldwide consumption. Among all beverage products, alcoholic drinks were an important segment in the region with beer being the major product. Beer consumption in Asia Pacific is the highest in the world while China is the largest market among all countries in the world. Annual consumption has been on the rise in some Asia Pacific countries such as Vietnam, India, and South Korea. The consumption of non-alcoholic beverages such as sugar sweetened drinks, health drinks, and fruit juices are also on the rise in Asia Pacific owing to increasing income levels and changing consumption trends. These factors will drive demand for beverage packaging materials such as rigid plastic, metal, and glass and will augment the packaging materials market growth through the forecast period. Flexible plastics is the largest materials segment in the packaging materials market in terms of volume. This segment is likely to be valued over USD 190 billion by 2024. The segments growth will be augmented by extensive usage in packaging food items and household products. The availability of a broad range of flexible plastic materials with distinct characteristics has turned this segment into one of the most important materials in the industry. The ability of flexible plastics to be manufactured in a range of shapes and sizes, lower weight, inert nature, superior performance characteristics, low cost, and easy printability makes it the most versatile packing material. Bags, pouches & wraps is the largest product segment in the packaging materials market as they are used for packaging a wide variety of items including food, detergents, beverages, etc. This segment will cover over one-third of the overall packing industry in terms of value. Characteristics such as lower comparative costs, ease of storage and handling, along with the availability of many specialty products like retort packaging, shrink films, etc. will augment bags, pouches & wraps packing materials market growth in forecast timeframe. 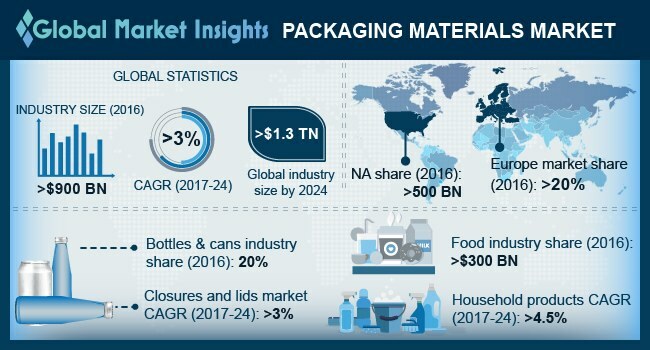 Among the end-users in the packaging materials market, beverage segment is likely to grow by a CAGR above 4% to reach a market value exceeding USD 300 billion by 2024. Rising popularity of health drinks, plant-based waters, sugar sweetened beverages and alcoholic drinks will be the key factor behind this segment’s industry development. Increasing consumption of packaged drinking water in across the globe also augment this end-user industry’s development throughout the forecast timeframe. The global packaging materials market has several key global players along with a large number of smaller regional manufacturers. Some major manufacturers of packing materials include Ball Corporation, Amcor, Crown, Mondi, Bemis, Owens-Illinois, Sealed Air, and many more. Major companies in the packing industry rely on production capacity expansions and acquisitions to strengthen their industry positions. For example, Amcor’s expansion of the production capacity of PET bottles in its Texas plant in 2017 was intended to cater to the needs of North American customers and is likely to help the company to increase its business in the region.